[Monday 4th February marked] the 20th anniversary of the day the Royal Air Force allowed me to serve openly as a transgender woman. As I reflect on the past 20 years of positive transgender inclusion in the British Armed Forces, US President, Donald Trump, continues to pursue his 2017 order to prevent trans personnel from serving openly in the US military in any capacity. Federal judges saw right through Trump’s prejudice, blocking his demands and allowing those already serving, since President Barack Obama approved open transgender service in 2016, to continue their work with skill, honour and respect. But in January 2019, a seemingly confused and ill-informed US Supreme Court made a huge and embarrassing mistake, supporting discrimination through its own contrary interpretation of what being transgender meant. Obama’s policy change was to recognise all brave and steadfast personnel. Trump and the Supreme Court, on the other hand, are making assumptions that servicemen and women can put their overwhelming and innate need to be true and free on hold for the whole of their career. The UK’s experience of transgender service, meanwhile, has proven an extremely positive one. When I transitioned in 1999, many people in the opinion pages of Britain’s tabloids and online forums demanded my instant dismissal, declaring I “wasn’t fit for service”, “was a liability”, “a danger”, and “a burden” to the armed forces. And yet the military decided otherwise, and a long history of being hostile to LGBT+ personnel was finally coming to an end. I had already spent 12 years as an air defence navigator on F4 Phantoms during the Cold War, and a further seven years as a navigator and tactics specialist on battlefield helicopters in a counter-insurgency/terrorism role. I was deployed to war zones several times, including the Gulf and Bosnia. But I hadn’t come out as transgender. I hadn’t dared to declare my true self previously, because like all other LGBT+ service personnel, I lived each day in fear for my own safety – not from enemy action, but from the ‘friendly forces’ I worked with. Hiding my own gender identity had been essential to my survival in an unforgiving world, from my youngest years, until I could no longer bear living the way I did. It isn’t easy to stand in front of a juggernaut loaded with decades of propaganda, hate and ignorance, knowing it can’t stop quickly or change direction overnight. I knew it would take years to do that. But those years have passed now. 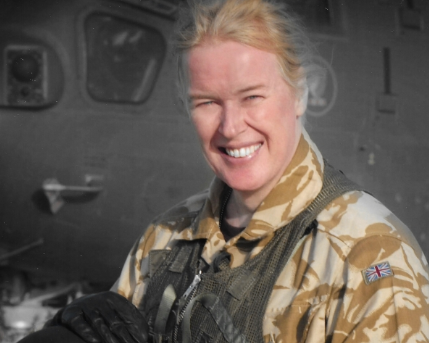 During a further 16 years as a female aviator, which included many tours of duty in Iraq and Afghanistan, my clear focus on enhancing tactical capability and aircraft protection systems was a direct result of being allowed to live my own life, without the menacing worry of exposure – and subsequent dismissal. My contribution was recognised as “exceptional service” – hardly the “liability, burden, or danger” proclaimed years earlier. In fact, most service personnel soon became positively supportive, and denigrating voices became hollow whispers. Sergeant-Major Joanne Wingate transitioned in the British army in January 1999, and others have followed us in all three services since. Their paths have been made simpler by the evolution of inclusive policy, which we both informed and helped advance, and the armed forces’ progressive attitude of support, which was shaped by the unquestionable evidence of the value of inclusion. The indisputable proof from the UK’s two decades of experience, combined with those of 18 nations that permit open transgender service, is that it is not disruptive to a military’s mission or capability in any way at all. There are no recorded negatives, only gains. The enemy of the United States doesn’t lie within its own service personnel. They stand on the frontline against danger, all of them. And any leader that denies patriots their determined and able role to serve, purely through bigotry, shows themselves to be an ignorant and unworthy leader. Trump is wrong, the Supreme Court is wrong, and the evidence is in plain sight. When people stand for their nation, their nation should have the moral courage to stand for them.